Since the time of Peter van Inwagen’s 1983 classic Essay on Free Will which introduced the Consequence Argument,John Martin Fischer has been arguing the case for a compatibilism that focuses on moral responsibility and agent control rather than compatibilist free will per se. Fischer was inspired by Peter Strawson’s influential 1962 essay,Freedom and Resentment, whichchanged the subject from the intractable free will problem to moral responsibility alone. Fischer also has been influenced by Harry Frankfurt’s attack on what Frankfurt called the Principle of Alternate Possibilities (PAP). Before Frankfurt, compatibilists and incompatibilists alike had argued thatalternative possibilities seemed to be a condition not only for free will but for moral responsibility. Frankfurt’s clever examples changed the debate from compatibilism vs. incompatibilism to the very existence of alternative possibilities. Although attacks and counterattacks continue, Frankfurt-style examples have become far too arcane and unlikely to win support outside a small number of compatibilists and incompatibilists. Regulative control involves alternative possibilities, which lead to what Fischer calls “alternative sequences” of action. Fischer thinks he can simply deny that agents have regulative control, and bypass the question of alternative possibilities, based on Frankfurt-style examples. Although Fischer generally supports Frankfurt-style examples, he is the author of one of the cleverest counterattacks, the idea that the mere possibility that the agent might try an alternative gives rise to a “flicker of freedom” (The Metaphysics of Free Will: An Essay on Control , p.131-159). Fischer wants to focus our attention on the more critical guidance control, which describes the “reasons-responsiveness” and “sourcehood” involved in the “actual sequence” of events leading up to the agent’s action. For Fischer, no alternative sequences, however many and however they flicker with freedom, are as relevant as the actual sequence. Being the source of our actions allows us to say that our actions are “up to us,” that we can take ownership of our actions. This is what Fischer regards as the “freedom-relevant condition.” It is what Robert Kane calls our “ultimate responsibility (UR).” And it is what Manuel Vargas calls the “self-governance condition” in his Revisionism. 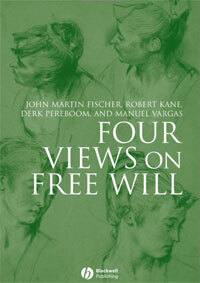 Kane, Vargas, and Derk Pereboom contributed to Fischer’s recent book Four Views on Free Will. Pereboom also focuses on moral responsibility like Fischer, but he disagrees with Fischer that moral desert justifies praise and blame, reward and punishment. At the most, says Pereboom, responsibility can justify that we can be “legitimately called to moral improvement.” Desert implies retributivism. Pereboom says the most we can justify is moral rehabilitation, for its beneficial consequences to society. Although Fischer is officially agnostic on the ancient problem of free will versus determinism, he shows a strong commitment to causality and determinism over his years of defending compatibility with determinism. Nevertheless, Fischer’s dividing of agent control issues into regulative control (involving alternative possibilities) and guidance control (what happens in the actual sequence) is an excellent approach that allows us to situate the indeterminism that many thinkers feel is critical to any libertarian model. Fischer notes that indeterminism in the alternative possibilities might generate “flickers of freedom.” And he says clearly (Four Views, p.74) that guidance control is not enhanced by positing indeterminism. In his 1998 book Responsibility and Control, written with Mark Ravizza, Fischer describes what he calls the Direct and Indirect Arguments for incompatibilism. The Indirect Argument says that determinism rules out alternative possibilities. From his semicompatibilist view, that does not threaten moral responsibility. Only in the Direct Argument for incompatibilism does determinism rule out moral responsibility. So might Fischer agree with a view that 1) allows the “freedom-relevant condition” (reasons responsiveness and ownership) in the actual sequence to be governed by what he calls “almost causal determinism” (Responsibility and Control, p.15n) and 2) allows indeterminism in the generation of the alternative possibilities (flickers of freedom)? That is the view we offer in the I-Phi Cogito model. Although they do not endorse it themselves, Daniel Dennett and Alfred Mele have also offered this view as something libertarians should like. Indeterminism is important only in microscopic structures, but that is enough to introduce noise and randomness into our thoughts, especially when we are rapidly generating alternatives for action by random combinations of past experiences. But our brain and our neurons can suppress microscopic noise when they need to, insuring what we calladequate determinism, what Fischer calls almost causal determinism, and what Ted Honderich calls near determinism – in our willed actions. The role of indeterminism in free will is better seen as simply generating Fischer’s AP “flickers of freedom.” These alternative possibilities are then the “free” part of “free will” (Fischer’s regulative control). The “will” part (Fischer’s guidance control) is “almost causally” determined to be reasons responsive and to take ownership for the determination to act in a fashion consistent with the agent’s character and values. Event-causal libertarians like Kane and Laura Waddell Ekstrom think this kind of freedom is not enough. And agent-causal libertarians like Randolph Clarke and Timothy O’Connor want even more “metaphysical” freedom. They say that if the will is determined to act in a rational way consistent with its character and values, then the agent will make exactly the same decision inexactly the same circumstances. Such consistency of action does not bother the common sense thinker or the compatibilist (even a hard incompatibilist?) philosopher. Kane, Ekstrom, and others continue to invoke some indeterminism in the decision process itself. As Daniel Dennett recommended as early as 1978 (inBrainstorms) and Alfred Mele has been promoting as a “modest libertarianism” in his recent books (Autonomous Agency and Free Will and Luck), indeterminism is best kept in the early stage of a two-stage process. We first need free (alternative possibilities) and then will (adequately determined actions) in a temporal sequence. First chance, then choice. I think that John Martin Fischer’s guidance control, perfectly compatible with his “almost causal determinism,” validates not only his semicompatibilist view of moral responsibility, but also supports the common sense or popular view of free will that is found in the opinion surveys of experimental philosophers Joshua Knobe and Shaun Nichols. While limited compared to “metaphysical” freedom, this view is consistent with a broadly scientific world view, a requirement for any systematic revisionism that Manuel Vargas calls “naturalistic plausibility” (Four Views, p.153). Ironically perhaps, this view would be the very opposite of a revisionism, in the sense that the diagnostic (descriptive) analysis of common sense would agree remarkably well with what Vargas calls the prescriptive view for philosophers. Or perhaps it is the philosophers’ views that need revision? As an illustration of just how naturalistically plausible this new view of free will is, consider the case of biological evolution. The evidence is overwhelming that variations in the gene pool are driven by random mutations in the DNA. Many of these mutations are caused by indeterministic quantum mechanical events, cosmic ray collisions for the most part. Think of the mutations as alternative possibilities for new species. An adequately determined process of natural selection then weeds out those random variations that can reproduce themselves and compete with their ancestors. First chance, then selection. Indeed, the story of life is maintaining some information stability (parts of our DNA have been the same for 2.8 billion years) in a chaotic environment – and not the pseudo-random deterministic chaos of the computer theorists, but real irreducible chaos. Only a believer in metaphysical determinism would deny the evolutionary evidence for indeterminism and two stages, the first microscopic and random (chance) the second macroscopic and adequately determined (choice). Sadly, such a metaphysical belief is the intelligent design position of the creationists. Of course we are discussing only science, not logical certainty. So we can also ameliorate John Martin Fischer’s nightmare of waking up one morning to a New York Times headline “Causal Determinism Is True” (Four Views, p.44). Nothing in science is logically true, in the sense of true in all possible worlds, true by the principle of non-contradiction or the weaker law of the excluded middle. It is the excluded middle argument that leads us to the muddled standard argument against free will. Our two-stage argument is quite old. We can trace it back to William James(1884 in The Dilemma of Determinism), Henri Poincaré (1906), Arthur Holly Compton (1935), and Karl Popper (1961). What does Information Philosophy have to do with the two-stage model? Information is the principal reason that biology is not reducible to chemistry and physics. Information is what makes an organism an individual, each with a different history. No atom or molecule has a history. Information is what makes us ourselves. Increasing information is involved in all “emergent” phenomena. In information philosophy, the future is unpredictable for two basic reasons. First, quantum mechanics shows that some events are not predictable. The world is causal but not determined. Second, the early universe does not contain the information of later times, just as early primates do not contain the information structures for intelligence and verbal communication, and infants do not contain the knowledge and remembered experience they will have as adults. The universe began in a state of minimal information nearly fourteen billion years ago. Information about the future is always missing, not present until it has been created, after which it is frozen. John Martin Fischer calls this the “Principle of the Fixity of the Past” (Responsibility and Control, p.22). It suggests that even divine foreknowledge is not present in our open expanding universe, lending support to the religious view called Open Theism. I am indebted to Kevin Timpe’s new book Free Will:Sourcehood and its Alternatives, which clarified many of the terms in the current debates and greatly clarified my rereading of Four Views, especially elucidating the positions of Fischer and Vargas.